As the importance of rail and intermodal operations continues to grow, so does the need for specifically tuned automation solutions. Camco’s offering includes automation solutions for the identification of containers transported by rail, the matching of containers to railcars, the condition tracking of containers and railcars, as well as their registration with the terminal host system. The goal is to optimize container handling and data accuracy, while reducing operating and labor costs. Manually performed visual inspections for train inventory and condition tracking purposes belong to the past. Camco’s rail OCR portal collects container and railcar data using OCR and records damage inspection images using line scan technology. Rail clerks can perform post-processing of the data using the TrainGate Operator application. Seamless TOS integration ensures that the data is instantly sent to the TOS, ultimately improving train turnaround times. Rail OCR portals can be installed at the entry or exits of terminals, on intermodal sections, or along railway lines. The speed, accuracy and reliability of Camco’s OCR camera portal make the introduction and maintenance of our gate automation systems very cost-effective. 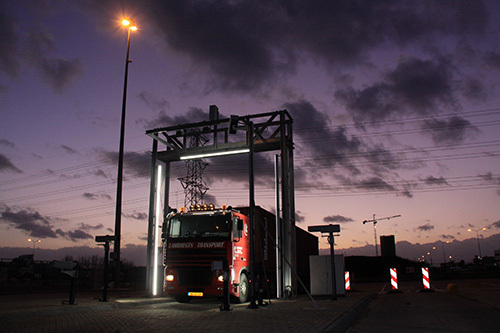 Each portal can process up to 500 trucks per hour, with OCR accuracy rates continuously exceeding 98%. A set of quality pictures is generated for condition tracking purposes. 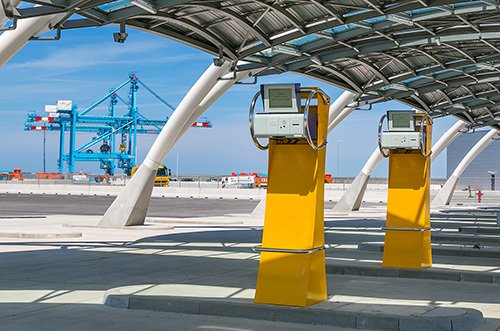 Gate kiosks are used in terminals with a truck driver ID card system to allow centralized driver identification and validation, as well as automatic logging of all drivers on-site. These unmanned self-service kiosks are typically installed at terminal entry and exit points, near the OCR camera portal.